An Ohio Amish cabin directory If you’re looking for an Amish-made cabin in Ohio, there are a lot of retailers to choose from. With Ohio being home to over 60,000 Amish, there are numerous Amish manufacturers of cabins and log products across the state, including log cabins, log homes, and other varieties of cabins. Whether you live in Columbus, Cleveland, Cincinnati, Akron, Canton, Dayton, Toledo, or other parts of the Buckeye State, an Amish cabin retailer is never too far off. For cabins in states beyond Ohio, view the Amish cabins main directory page. 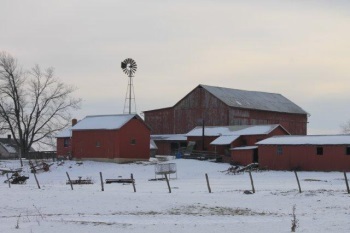 Buckeye Barns features a range of Amish and Mennonite built outdoor structure including the Classic Kentucky cabins. Barn style cabins with a range of options. Amish hand-built. Features Amish quality carpentry. Amish-built log cabins available. Amish built small portable cabins for different uses (hunting cabins, garden sheds or storage buildings). The Home Place is a family owned and operated business, and provides a range of products made by Amish/Mennonite craftsmen from central Ohio and northern Indiana. Their Cabins are built mainly by Mennonite contractors, on site. Each piece can be delivered as a portable building. A range of options to choose from including siding colors, windows, floor, interior and exterior features and more. See above entry for Ohio Outdoor Structures in the Akron area. This is a small company that has been in business since 1974. They specialize in quality log homes built by a skilled Amish crew. Dutchland Realty offers pre-designed plans to suit customer’s needs. Their Amish crew will build log homes within a 70-mile radius of Berlin, OH. Specializes in conventional home construction, home improvment and landscaping. Offers residential and commercial structures along with carpentry, staining, roofing, flooring, deck/patios and more. Carries a big selection of handcrafted Amish cabins available in a variety of styles including the hunter’s deluxe, the vacationer, cottages and more. Carries an extensive line of storage structures including cabins, in different styles, colors and options. Broad choice of Amish built outdoor structures including cabins in a full line of styles, for different uses. Amish hand-built cabins available. Broad choice of options including trim and siding colors, roofing, floor, windows, doors and more. This company specializes in Amish pre-built log cabins delivered to the customer’s site. ‎Some styles of their buildings include recreational log cabins, log screen houses, log sun houses and children log play houses available. A little over an hour south of Toledo. An hour east of Lima, in the Upper Sandusky area. Provides quality built cabins along with storage barns, garages, playhouses, chicken coops, equine barns. Please confirm hours of operation of Amish cabin sellers given here. Locations and opening hours can change. Amish-owned businesses will be closed on Sundays given Amish beliefs about the Sabbath. Non-Amish cabin dealers may be open. Not responsible for any changes to the above information. Geauga County: Large Amish settlement an hour east of Cleveland. Numerous Amish wood manufacturing businesses. Holmes County: The largest Amish community in Ohio and possibly the nation. Stretches into neighboring Wayne, Coshocton, Tuscarawas Counties. Hundreds of Amish home businesses can be found here including numerous manufacturers. Kenton (Hardin County): A sizeable Amish community in western Ohio. While many Amish here farm, there is some moderate business activity. Looking to Build in the S.E. Akron area in a couple yr.s. Planning a 2 Bdrm.retiement home around 800 to 1000 sq ft. Thank You.